While the 7th Oudh Irregular was at Lucknow a large section of the regiment Mutinied. This was repeated in many regiments throughout the Bengal army. On 30th April 1857 the men started complaining about using the new cartridge which involved biting greased paper. Rumours had spread about it's being unclean. Lieutenant Mecham remonstrated with them and initially they were placated. But on the 1st May the sergeant-major reported that the recruits were refusing to bite the cartridges or even handle them. The whole squad of 30 men were confined to the quarter-guard. The remaining soldiers were dismissed but hung around in groups. The native officers were reluctant to get involved but the Havildar-Major was loyal and reported that the older sepoys had taunted the recruits about loss of caste. By 3rd May the men were threatening to shoot officers who forced them to use the cartridge. Brigadier Gray tried talking to the men but the situation was still bad. At one point, Mecham was threatened by mutineers but kept a cool head, "It is true that you may kill me but what good will my death do to you? You will not ultimately prevail. Another adjutant will take my place and you will be subjected to the same treatment you receive from me." He remained unhurt. Eventually Sir Henry Lawrence intervened with a British force of 32nd Foot and a battery of guns, also 3 native regiments and 2 native cavalry regiments. The 7th Oudh were paraded and ordered to lay down their arms. Some tried to run away but were caught. They arrested 57 ringleaders and the native officers were dismissed. There were 200 men allowed to remain armed. Of these men, a company was sent to quieten disturbances at Malhiabad fourteen miles away. They were under the command of Mecham and Captain Weston. They also had 40 men, with native officers, of a loyal Irregular cavalry unit. On the march to Malhiabad they were surrounded by about 3,000 angry Muslim men and had to make a run for it. When they arrived the place was in uproar and they had to use Weston's skills as a linguist to calm the situation. He also knew many of their leaders and was able to reason with them. They could not trust the men of their own regiment but were reliant on the cavalry to keep order. One of the Risalders of the cavalry had gone into the town to find out how things stood but came galloping back with a warning that an attack was imminent. They took up defensive positions in a mosque and waited while a huge force of men surrounded the place, beating drums and shouting. But then, after a few hours they dispersed. All was quiet for a few days until news came from Sir Henry Lawrence that mutiny had broken out in various other cantonments and that they were to return as fast as possible to Lucknow. At the same time news of another attack came in so they struck camp and took a circuitous route to avoid the approaching enemy. They were fired on from every village they passed and had to remain in a skirmishing formation most of the way. They did not rest until they reached Lucknow at 4am on 31st May, unable to believe that they were still alive. Their men had stayed loyal, although they said that if, on their return they found that the regiment had mutinied, they would follow. 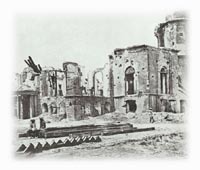 One of the focal points of the Indian Mutiny was the siege of the Residency at Lucknow. Lieutenant Mecham was one of the besieged British officers who survived. He wrote of his experiences in his book published in 1858. One particularly memorable incident occurred on 18th August when a mine blew up throwing him into the air and killing 7 members of a corps of drums. One of the drummers, Band-Sergeant Curtain of the 41st NI was blown outside the defences and decapitated by the rebels. Six other drummers were buried in rubble and remained there. A breach was made in the wall by the explosion but the enemy failed to get through. Although Mecham was badly bruised he suffered no serious injury.